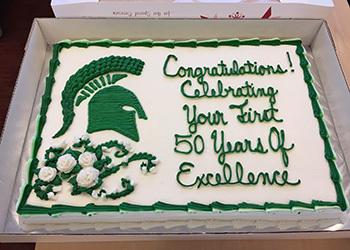 James Madison College has an outstanding record and reputation as we celebrate our 50th anniversary. Alumni, students and friends have been crucial to the college and fought to save the college from closure in 1981. Now, your gifts in honor of JMC’s 50th anniversary can positively affect the next 50 years. Inspire your fellow alumni, students, faculty and friends to make Madison’s next 50 years even better than the first. Your Support Will Inspire Others… Make a Difference! Gifts from you and other Spartans will demonstrate the depth of support people have for the college. It will show a commitment to keeping Madison at the forefront of undergraduate education and maintain our position as a leader. We know a Madison education is “second to none” and private financial support helps to advance the college’s outstanding record and build our reputation. Your participation makes a difference and sends a message. Donations of $50 are suggested as a way to celebrate our 50th anniversary; however, smaller and larger gifts are welcome. The most important action is to show your support by making a gift of any size. Then ask your fellow alumni, students and friends to join you by making their gift. Take your love of your alma mater viral and help Madison break its record for both the amount and number of annual donors. It is a great way to celebrate the past and inspire the college’s future! Build the JMC Fund for Excellence Endowment to create an annual income to support the college! Reoccurring income from the JMC Fund for Excellence will help the college make multi-year commitments that do not depend on state appropriations or MSU budget allocations. These are funds the college will control and allocate to its top priorities each year. If you would like to make an anonymous gift, follow the link. *Make check payable to Michigan State University and write “Appeal 18OOPCF1JMC5050” in the note section.